It was a beautiful, if cold, night down by the sea, bright stars and the dark water. I felt considerably better than on my Sunday run. A very hard cold run in a fierce north easterly wind to Firle Beacon and back by way of Bishopstone. 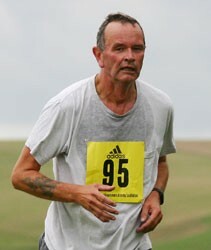 Two weeks till the Hastings Half Marathon and nine weeks till the Three Forts Marathon. In Kilkenny for the HSLG conference, I ran first out of town on the Athy road, then back and into the centre. I chose an easy route for my first post-Sussex Beacon run, down to the sea front, along a little way and back. It was not the nicest day for the Sussex Beacon half marathon: windy, wet and cold. At around mile 8 my legs really began to hurt, but I finished in a reasonable time. Update: I've just had a text with my official time: 1:46:10. I was 954th. Three weeks till the Hastings Half Marathon and ten weeks till the Three Forts Marathon. It was bright, windy and the tide was high. I ran out to Bishopstone, then to the sea, along the front to Splash Point. Gargantuan yellow lorries were roaring up and down the beach, shifting shingle. I seemed to find a good pace and style. Garmin have announced that they will soon support Macs. I ran in the afternoon, not something I usually do, but I hoped that the weather might improve. But it stayed windy and wet. I went along the front to Newhaven, up over Newhaven cliffs, where there ewer some very slippery patches. I went as far as Phyllis Avenue in Peacehaven, a little beyond the George V memorial, at which point the Forerunner said I'd done eight miles. As my target was 16 I turned round, but was a little disappointed to see a total of 15.89 when I got home; I don't wear my specs while running, so find it difficult to read the display as I go along, especially in the rain. But it will do, it's further than I've run for a while. 1 week till the Sussex Beacon Half Marathon, four weeks till the Hastings Half Marathon and eleven weeks till the Three Forts Marathon. I now have my numbers for the first two events, 927 and 1376 respectively.